Couple give up the rat race to buy a derelict mess of a place with more land than they know what to do with, all in search of 'The Good Life'. It seemed just like something out of one of these reality TV programmes you see on telly: Couple give up the rat race to buy a derelict mess of a place with more land than they know what to do with, all in search of 'The Good Life'. But is it really as idyllic as it seems? When they're out there in the wind and the rain do these people not hanker after a warm, comfortable office with a reliable income? Oliver and Lara Madge would be the ones to ask. 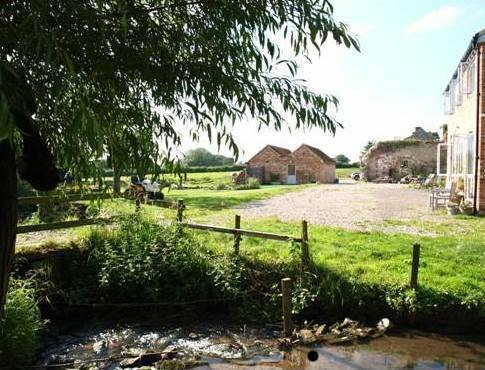 Just under four years ago the couple stumbled across a 20 acre smallholding in Gloucestershire, with a derelict 6 bedroomed farmhouse and two crumbling outbuildings to boot. With near on little experience in farming, outdoor life or renovation projects, the couple fell instantly in love and moved heaven and earth to become owners of the dilapidated property they had fallen for so deeply.... and then the fun began. They moved in January 2009 in the middle of one of the worst winters Britain had seen so far. Into house that had massive cracks in the walls, rotten window frames and no central heating. This was to be their first challenge. However, as they enter into their fourth year things are starting to bloom. They now keep free range , rare breed pigs, sell award winning pork, offer a veg box scheme, keep ducks and chickens for eggs and are progressing down the path to self sufficiency, which was part of their dreams when they first saw the farm . And most importantly, both outbuildings have been renovated. This is where the journey really begins. The old Stables is now a one bedroomed holiday cottage which is proving to be a perfect holiday getaway or secluded honeymoon retreat . The Cow Shed has been reinvigorated as a fantastic, multi-purpose venue. Its big double doors open out onto the old orchard making it a perfect place to be. It has already hosted events including corporate sales meetings, birthday parties and baby naming ceremonies. The renovation also lends itself as a training venue with an open plan area fully equipped with a projector, WiFi and everything else you would expect but is just as easily transformed into a cosy pop up restaurant. 2013 will see The Cow Shed flourish with its versatility and become an excellent venue to inspire and be creative within the natural backdrop of the smallholding. The Madges have made the Cow Shed attractive to a wider audience by enhancing the work ethic and honesty from the original building, to provide an experience with a difference. No more are stuffy hotel rooms a necessity of events and functions. The Cow Shed provides everything that is needed with the ability to 'inspire, relax, create and enjoy'. "Our strapline is 'A Slice of the Good Life!' and that's exactly what we would like to offer guests that come to the farm" says Oliver. "All catering is homemade, with most of the ingredients coming directly from the farm". When asked whether this has all been worth it, Oliver gives a wry smile. "Of course " he says with complete confidence. "It's not been for the faint hearted but Park Mill Farm is now a fantastic tranquil retreat with a host of features that most would long for - who wouldn't want to be here?